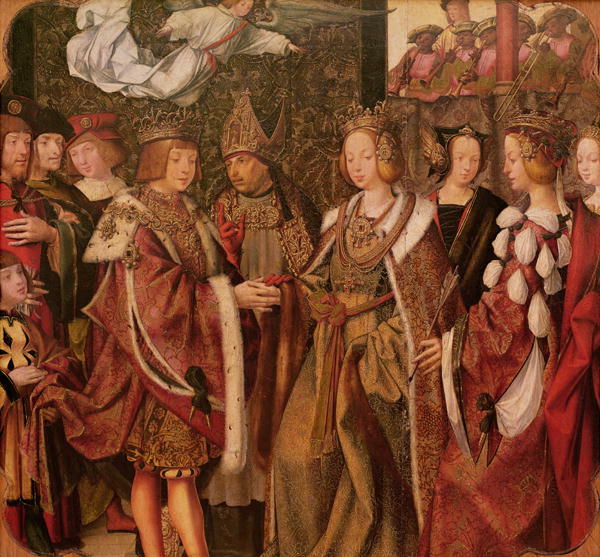 I recently added the below altarpiece to the 16th century timeline. 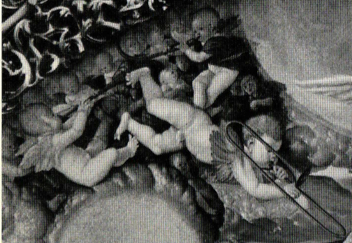 The religious significance of the early trombone is actually reflected in several altarpieces from the 16th and early 17th centuries; I’ve included 5 others in this blog post, all of them currently shown in the timeline. 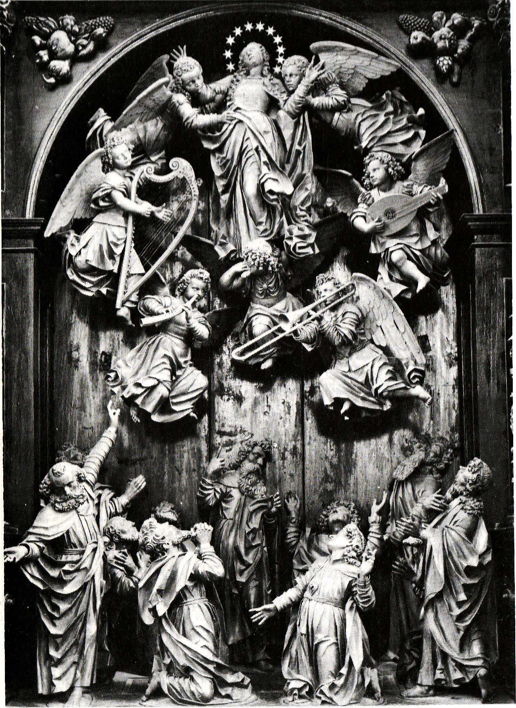 Unlike the trombones on organ cases, which are clearly centered in Germany, the altarpieces seem to be spread throughout Europe. 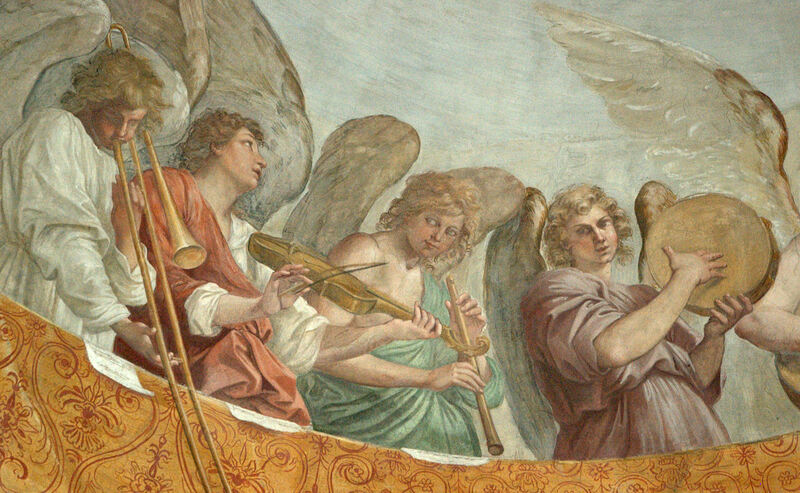 1592-1601—Fribourg, Switzerland: The Augustinian monastery’s altarpiece by Peter Spring depicts a group of angel-musicians, including an angel playing a trombone (see above image; public domain) (Wold 82). c. 1520—Spain: The Engagement of St. Ursula and Prince Etherius, sometimes also titled St. Ursula and Prince Etherius Making a Solemn Vow, a panel painting from the Master of Saint Auta Altarpiece, depicts a trombonist with a wind band performing from a loft or window. 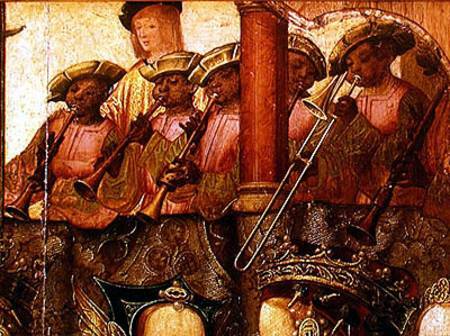 The painting may represent the earliest visual depiction of a black trombonist (see above detail and full image; public domain) (Lisbon, Museu Nacional de Arte Antiga, Inv. No. 597) (Bowles, Musikleben 30-31). 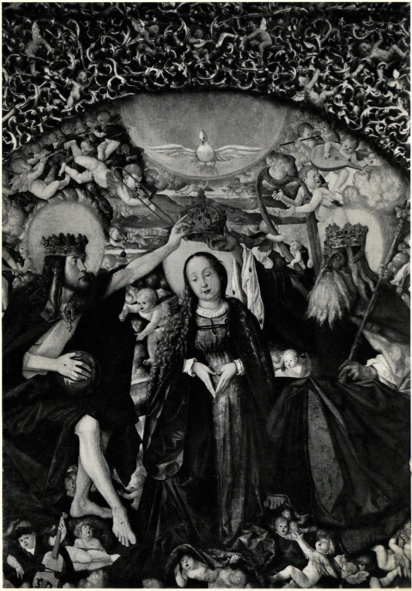 1516—Freiburg, Germany: Hans Baldung’s painting, Coronation of the Virgin, the central panel of an altarpiece located in the Freiburg Cathedral, includes an angel-trombonist among a group of angels playing wind instruments above and to the left of the Virgin (see above detail and full image; public domain) (Burkhard pl. 2). 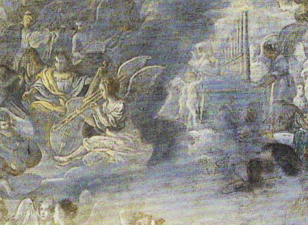 c. 1595—Frankfurt, Germany: Adam Elsheimer’s, The Exaltation of the Cross, part of an altarpiece of several copper panels, portrays an angel playing trombone among a group of other angel musicians. Elsheimer, known for his variety of light effects, places the trombonist near the burst of light at the top of the painting (see above detail; public domain: wikimedia commons) (Klessmann). 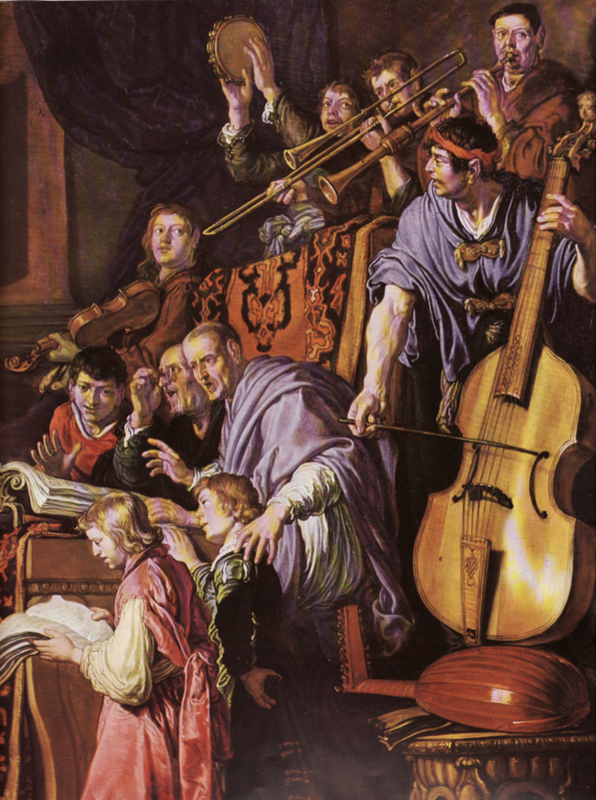 1618—Pieter Lastmann’s altar scene, David in the Temple, portrays a trombone performing with voices, tamborine, pommer, and 2 string instruments (see above image; public domain) (Kinsky 177; Buchner 254). 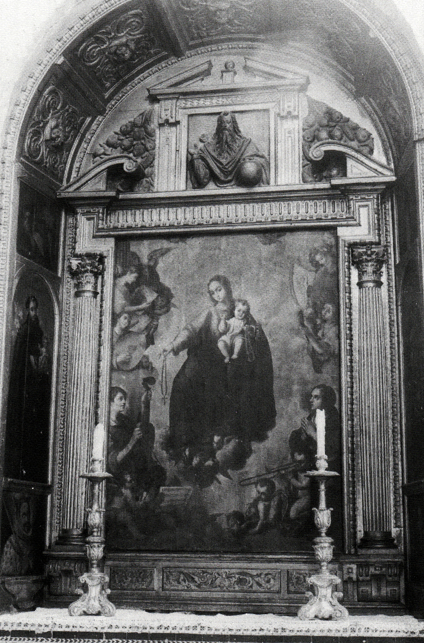 c. 1620-24—Seville, Spain: The altarpiece of the Virgin of the Rosary of the Parish of Santa Ana, probably painted by Diego López Bueno and Miguel Cano, includes a depiction of an angel playing trombone (see bottom-right of above image; public domain image) (Alonso Cano 613).